For Gainesville, Fla., and the University of Florida, this typically is the time of waning summer heat and a football season in full swing. But not this week. The Gators have a “bye,” but that calm was replaced by live-streamed images of armored vehicles, hundreds of state troopers and thousands of protesters. The air was filled with chants of “Our town, our State, we don’t want your Nazi hate” and the sound of drum circles. Other images: The bloody mouth of a man wearing a tee shirt emblazoned with swastikas, and police restraining demonstrators. The demonstrators, of course, were protesting against alt-right speaker Richard Spencer and his message of hate. The First Amendment – which guarantees that “Congress shall make no law respecting an establishment of religion; or abridging freedom of speech or of the press; or restricting the right of the people to peaceably assemble and to petition the government to redress of grievances” – is getting a workout today. Spencer’s scheduled speech on the Florida campus was intended to espouse his theories of white supremacy, white nationalism and racism – and it has turned this college town into the epicenter of a clash of ideas. Reports indicate there were thousands protesting Spencer’s speech, but only about thirty supporters. Irresistible questions arise. Must the University of Florida allow Spencer to speak? Should the media cover the events that result from him speaking? Should students and citizens attend, and if they attend, should they listen? Or should they object? Or even shout Spencer down and prevent him from being heard? First, it appears clear that the University of Florida cannot and should not refuse to allow Spencer a place and an opportunity to espouse his message of hate. His disgusting rhetoric makes our anger hot, makes our blood cold, makes our skin crawl and our gut tight. However, the First Amendment prohibits the government from inhibiting his right to say and shout all of those things we hate to hear. Must the media cover these occurrences? How can the media not cover such insidious and dangerous events? While the possibility of violence was high enough that Florida Governor Rick Scott declared a state of emergency, the content of Mr. Spencer’s speech is even more dangerous. Even though fewer than fifty supporters came to hear Mr. Spencer, it is important for us to know that they exist. It would be irresponsible for the media, and a dereliction of their duty as the ears and the eyes of the people, not to be in Gainesville to report on these events. It is important to our democracy that we understand what Mr. Spencer and his supporters, who have already made appearances in several other places, stand for. Should people attend? Should people protest? 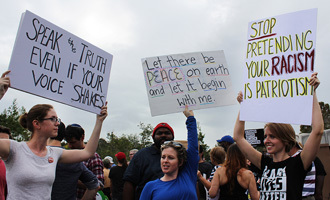 Should the students and the citizens of Gainesville be present at the site of the speech? Should they go so far as to enter the hall and attend the speech? Or should they stay away? Should the students have gone to classes, as University of Florida President Fuchs urged? In the spring of 1972, when the United States bombed Cambodia during the Vietnam War, Gainesville erupted in demonstrations and riots. Students and citizens alike marched in the street to express their displeasure at the government’s actions. People attended to voice their views but mostly for the excitement of being in the streets, to be part of it all. It is a lure that is almost irresistible. It is an experience that one will, for years, reflect on and say “I was there when …,” and be proud that they were. So, yes, for these and other reasons, we must attend. But should we, or must we, once inside the hall, give Mr. Spencer the opportunity to espouse his hate? We are required by law to allow Mr. Spencer to speak at the University of Florida. We are even required by law to pay the costs, in excess of $600,000, to make it a safe place for him to speak. The media must cover the events occurring at and around his speech so we can know what happened. And, just as importantly, those of us who can, must attend and protest. To do otherwise and ignore this would be to accept the unacceptable. Should we have shouted him down? Should we have, by voicing our objections, not allowed him to speak? Here, the First Amendment fails us. It is the government that cannot obstruct the five freedoms of the First Amendment, not the people. Each one of us must make this hard decision on our own. Jack Kirschenbaum is a Newseum Institute trustee and is a Florida-based attorney who specializes in First Amendment law and litigation. This entry was posted in First Amendment News, Inside the First Amendment, News by Admin. Bookmark the permalink. Great article Jackie, but that’s what I would expect knowing you wrote it. I’ve said this hundreds of times since the conclusion of the 2016 election, “The first responsibility of a new president is to bring the country together as closely as possible to be a nation of one”. Sadly, our president hasn’t mentioned that in any speech/lectures, responses or tweets. People like you are taking the ball, so continue on Jackie, you have many supports in your corner.